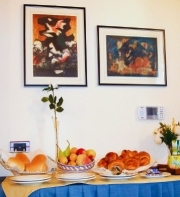 The B & B is located at number 45 in the central Via Atenea, known as the city of Agrigento, the salon. The town is best known as the city of temples, but the monumental heritage of the city is much more diverse. There are a number of thematic routes, along which you can explore Agrigento with its entire territory. The Bed & Breakfast is located within the famous building Biondi, since the year 1700 belonged to the family Sala, one of the richest and noblest families in Sicily. In 2008 was born the Bed & Breakfast "Marchese Sala”. Sophistication and elegance make of the Bed & Breakfast a holiday accommodation of highest category. Every day at 18.30 clock, we offer our guests in collaboration with the farm Bagliesi an aperitif made from organic wines together with typical Sicilian fruit. Agrigento can be reached from the Motorway A18 Messina- Catania and Motorway A-19 Catania-Palermo, until the exit Caltanissetta and running along the Highway S.S. 640 Caltanissetta-Agrigento. You can arrive at Agrigento running along the Highway S.S. 121 and going on along the Highway S.S. 189. The international airport of Catania-Fontanarossa has the best connections with the city of Agrigento. The SAIS Company manages transport departure from the airport almost every hour. The airport of Palermo is at 35km from the city centre and it is connected with Agrigento by buses (different companies) and by train.